Thanksgiving is a time-honored American tradition that harkens back to the best this country has to offer. Compassion, family and whitewashing genocide — the very pillars of our national identity come to the forefront on the fourth Thursday of November. Thanksgiving has been a national holiday ever since Abraham Lincoln made it so on Nov. 26, 1863, just one week after he consecrated the Union dead in the Gettysburg Address. Before that, Americans held celebrations of gratitude intermittently dating back as far as the Plymouth Colony in 1621. Like their Civil War counterparts two centuries later, those early settlers were just glad to be alive, and they did their best to share that happiness among each other. But let me ask you: in these modern times, when our survival is all but completely assured, do we really need to celebrate being alive? Is Thanksgiving necessary in the Era of the Snuggie? Turkey Day is nothing but a bygone festival for people with buckles on their hats. Like the turkeys bred for the holiday, Thanksgiving needs to die. It’s just a waste of a good business opportunity. We’ve watched as mega-corporations like Amazon and Walmart have slowly and graciously granted us freedom from the time our old fogey grandparents wanted us to spend with them over the next couple of weeks with extensions on Black Friday and the brand-new Cyber Monday. Who wants to recover from a turkey hangover around an open fire surrounded by their loved ones when they can just murder people for dibs on a new TV? Let’s take a look at the holidays that sandwich our so-called national so-called day of so-called gratitude. Without Thanksgiving, we could stretch Halloween, the spookiest of jamborees and the sole reason for Party City’s continued existence, into a weeklong extravaganza. Forget costumes and candy, let’s just have a full-on Purge. Costumes stores everywhere would make a killing on those creepy masks. The traffic afterwards would be sublime. We could take the next few weeks before December to do what we’ve been building towards for years and stretch out the holiday season into an all-conquering behemoth of materialistic ecstasy. Let’s just drop the Christian pretenses for Christmas entirely; they get in the way of turning a good profit. Luke 2:14? MORE LIKE LUKE SKYWALKER LIMITED EDITION LEGO FIGURINE! I’d rather listen to Mariah Carey in a church than one of those lame hymns anyway, am I right? Subsume the entire month of November beneath the hulking treads of capitalism. 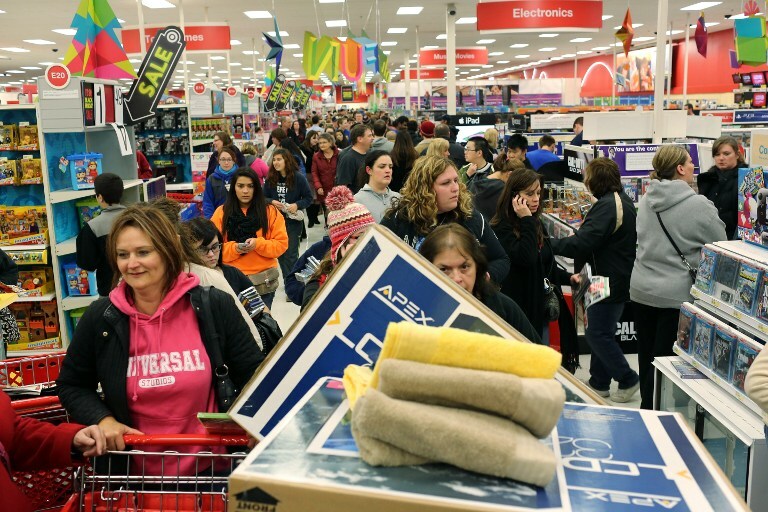 Crush the miserly under hordes of Black Friday Walmart shoppers. It’d be perfectly in keeping without our history. After all, the whole reason we celebrate Thanksgiving this Thursday is because FDR wanted to give people more time to shop. So why not take that next step and just eliminate the shopping impediment altogether? I know this Thursday night, after I yell at my uncle, I’ll head on down to Target with a torch and a pitchfork. I’ll do my part, what about you?